Vancomycin can produce a variety of side effects including symptoms like fever and fatigue. This medication can be especially dangerous when taken by pregnant women, in conjunction with other medications, or if underlying medical conditions exist. An explanation of these vancomycin side effects and what to look for when taking the medication is discussed at length below. Common side effects of vancomycin will vary depending on how the medication is taken. Injectable forms of vancomycin are thought to cause pain and irritation at the injection site as well as ringing in the ears. Side effects will vary depending on the person, and an underlying medical condition can also cause these symptoms to be more prominent in patients. Serious vancomycin side effects are rare, and they are experienced in less than 0.1% of patients that use the medication. Damage to the kidneys and to hearing were serious side effects of early versions of the drug, and later trials using purer forms found that nephrotoxicity is an adverse side effect. These side effects are accentuated and more common in the presence of aminoglycosides. People that are prescribed vancomycin will want to let their doctor know if they are suffering from a chronic illness. Patients that are experiencing kidney disease, hearing loss, or dehydration are of particular concern. The presence of these underlying conditions can worsen both common and serious vancomycin side effects, and they can leave serious damage on the body. Vancomycin has been categorized by the FDA has been assigned to category B in regards to pregnancy. The potential nephrotoxic and ototoxic effects of this drug on infants were evaluated in a study involving the intravenous administration of the drug during the second and third trimester to women with serious staph infections. No sensor neural hearing loss was attributed to this therapy, but the drug is still only recommended for use in situations where the benefits outweigh the risks. The medication is also excreted into human milk and can be transferred to a nursing baby. 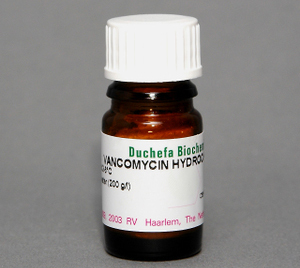 Vancomycin has shown success in the treatment of life threatening bacterial infections, although it is not recommended for use unless all other possible alternatives have first been exhausted. This medication can produce a variety of side effects, with some being common while others are more serious. This medication can be especially dangerous when taken by pregnant women, in conjunction with other medications, or if underlying medical conditions exist, so it is important for patients to discuss all possible interactions before beginning treatment with vancomycin.